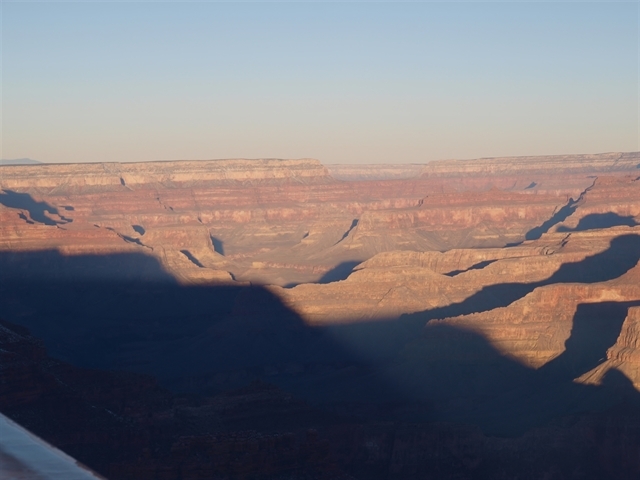 Above is web cam view of Grand Canyon this morning, looking west-northwest from the Yavapai Point Geology Museum - temperature at the Canyon South Rim fell to at least - 5 F. The NWS web site observations link is broken now for the third day, so details regarding lows at ASOS sites are sketchy this morning. Here at the house we had a morning low of 23 F - a hard freeze for this part of the City along the Rillito. Other lows - TUS about 32 F and Douglas about 14 F. Sasabe RAWS hit 18 F, while Empire RAWS dropped to 21 F.
There were two freezes here during November - 32 F on the 18th and now 23 F on the 30th. Rainfall amounted to only 0.37 inches, which was near the median for my period of record. The QPF plumes from the 00 UTC run of the GEFS ensemble models (above for TUS) illustrate how, at times, the ensembles can actually confuse the forecast, with different members forecasting rainfall on three different days through the 7th of December. Certainly no convergence or consensus at this time. Meanwhile the 00 UTC WRF-GFS (on the 5.4 km grid, below) forecasts little precipitation for Arizona and northwestern Mexico through 5:00 pm MST on December 7th. Cold morning temperatures will prevail, but with little chance of rainfall here. Bit of snow at higher elevations early this morning. 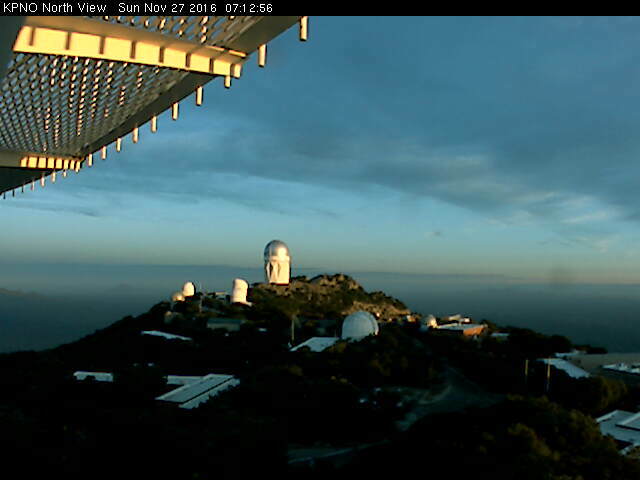 Above shows a couple of inches at General Store in Summerhaven and below shows just a dusting at Kitt Peak. Here at house we had 30 to 40 mph winds as the front passed and some rain both before and after midnight. Total ended up at 0.11" and the GEFS average from 06 UTC yesterday morning was quite good - 06 UTC WRF versions were a bit dry for the metro. Several issues noted this morning. 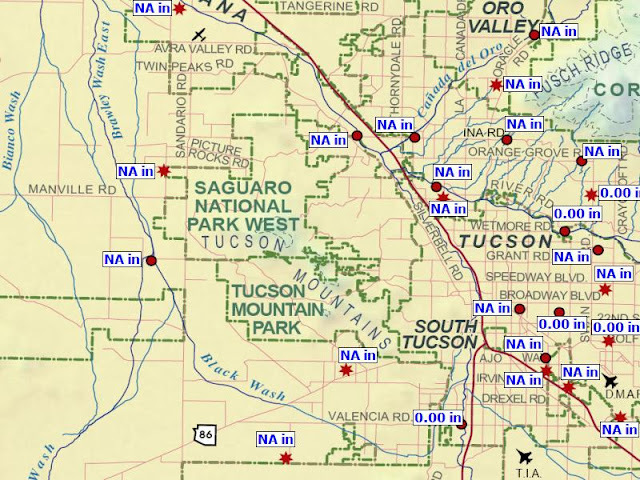 First, the Pima County ALERT map (above for 24-hour precipitation though 7:00 am MST) no longer fits my screen well, and I can't do a proper snip to show the entire array. Rain amounts were generally quite light, but one site on Redington Pass reports over half an inch. Sadly, the old version display of the data (metro west sector below) is no longer updating. This is distressing to me, since the old version is (was) extremely versatile wrt examining precipitation across varying time periods and also for looking back to past events. Serious loss for those interested in using the ALERT data for research. Finally, the radar/gauge product from WDT (below, which is my preferred product of this type) illustrates some beam blockage artifacts this morning - below is 24-hour estimate and sectors where lowest beams are blocked show clearly. Reason for this is that the precipitation echoes with this event had very low tops - thus, if gauges not available then radar estimates were too low where lowest tilts weren't available. Radar-based precipitation estimates remain a difficult product to evaluate or use in research where terrain is complex and substantial beam blockage is present. 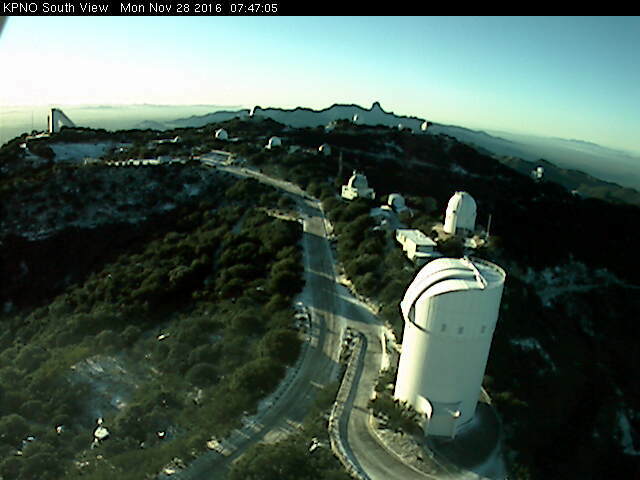 Early sun catching parts of Kitt Peak telescopes this morning a bit after 7:00 am MST above. A strong, 500 mb, short wave will move across Arizona tonight, accompanied by a leading jet streak at about 250 mb with maximum wind speeds over 150 kts - quite impressive. A trailing short wave, digging southward across the Four-Corners, will bring cold temperatures to southeast Arizona early Wednesday morning. The event tonight is, unfortunately, another one that is very starved for moisture. The GEFS plumes for QPF at TUS (above) indicate a good chance for light showers tonight across the metro area. The 06 UTC WRF-GFS forecast for total precipitation through 11:00 am next Wednesday morning (below on the 5.4 km grid) indicates an event that mostly impacts the mountains of the Southwest, with little or no precipitation at lower elevations. The forecast for the 500 mb level from the same run is shown below (again 5.4 km grid and valid at 6:00 am next Wednesday morning) and indicates cold to very cold temperatures (-30 C and colder over Four-Corners region), as the trailing short wave slides across northeastern Arizona and northern New Mexico. The surface temperature forecast for metro Tucson from the WRF-GFS runs indicate low temperatures dropping into the low to mid 30s F early Wednesday morning. Here in the north part of the City of Tucson, along the Rillito wash, it is likely that we'll have our second freeze of the Fall (the first on November 18th only did slight damage to some tender, potted plants here), but if the WRF forecast verifies it is likely that we'll experience a hard freeze here with temperatures of 28 F or colder for a few hours. Will wait to see what happens - my basic approach to living in this cold zone of the City is that what survives belongs and what doesn't doesn't - so I don't go to the trouble of covering any of the landscape plants during the winter. Models continue to bounce around for Sunday night weather event, but what's certain is that it will bring a significant cool-down. Above graphic shows the GEFS plumes for QPF at airport from 00 UTC yesterday evening, with three members continuing to forecast 0.00" for TUS and three other members forecasting over 0.30". The operational version of the GFS (blue) is essentially the same as the ensemble average, with its forecast of just over 0.10". The next run at 06 UTC indicated all members forecasting measurable rainfall. The NWS high-resolution, hourly grid forecast for TUS (above) was probably driven by the 00 UTC operational forecast shown at top. 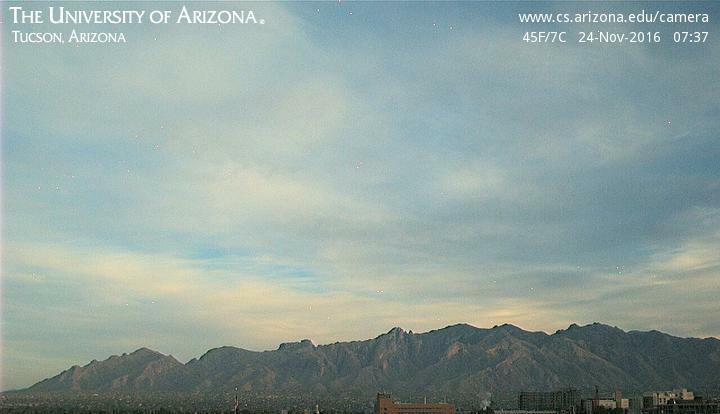 From 5:00 PM MST tomorrow through 5:00 am Sunday morning the forecast for TUS indicates POPs of 51 to 16%. Current NWS forecast for airport is 50% for at least 0.01". During this period the grid forecast indicates that 0.10" of rain will fall at airport. Obviously, if the QPF forecast verifies, then several of the hourly POPs will have to be busts as will the NWS 50% POPs - just one of the many inconsistencies that plague NWS forecasts. Meanwhile, the 00 UTC WRF-GFS forecast on the 1.8 km grid (also driven by the blue curve at top) continues to forecast no rainfall at the airport through noon on Monday - below. The 06 UTC WRF-GFS also forecasts no rain at TUS. What's actually going to happen at airport regarding rainfall? Hard to tell from this GFS mish-mash, especially since PW forecasts indicate there will be little available moisture during event. The winds at Hopkins yesterday were just about as anticipated (see previous post) with 6 hours having RAWS observations with gusts over 30 mph - max was 36 mph at 9:19 pm MST. The WRF sounding forecasts were again quite good, indicating a marginal wind situation because of shallow depth of low-level easterlies. There was considerable reference to the high resolution, deterministic, grid point forecasts produced by the NWS in the previous posts discussing restructuring. These are available for every hour out to seven days. This morning provides an example of far awry even the first hour can be under a mundane synoptic setting. Above graphic shows the start of hourly forecasts for TUS beginning at 6:00 am this morning. The observed temperature (red) at that time was 57 (11 F warmer than the grid forecast); Td (green) was 12 F (8 F lower than the forecast). Winds (purple) were from the correct direction but a bit stronger than forecast (observed at 6:00 am was ESE at 14 with gust to 21 mph at 25 minutes after the hour). This is a huge and resource intensive forecast exercise, but not one that would inspire much confidence in users. Looking ahead to the potential rain event - the TUS grid forecast for 3:00 am early Monday morning is: T = 42 F, Td = 37 F, POPs for that hour 57 %. That forecast may prove better than the hour one forecast. The 06 UTC GEFS plumes for QPF at TUS are shown above. The plumes indicate some chance for three different precipitation events through December 3rd, but with main event occurring Sunday night. Amounts forecast by the ensemble members range from 0.0" to 0.4" and indicate about 80 to 90% chance of measurable rain at the airport (i.e., 0.01" or more - current NWS chances are at 60%, similar to grid point forecast). The 06 UTC WRF-GFS forecast of precipitation through 11:00 am Monday morning is shown below. This version of the WRF forecasts a donut hole over much of Tucson area and focuses the precipitation over higher elevations of the Sky Islands. The NAM version is wetter and forecasts 0.3" at airport. The moisture for this event comes in from the northwest with the 500 mb short wave and thus is not great and also is quick htting. Will be interesting to observe how this event actually transpires, since it is almost three days away. Hope all who visit here have a great Thanksgiving Holiday, and avoid the crushing mess of Black Friday shopping - which I guess now starts today at many mercenary venues. Will be very low-key day here, since I had surgery for a hernia yesterday and am dealing with some aches and pains this morning. Today has dawned with high clouds producing a bit of a dreary morning - above. Took a look at 06 UTC WRF-GFS forecasts of outgoing longwave radiation. 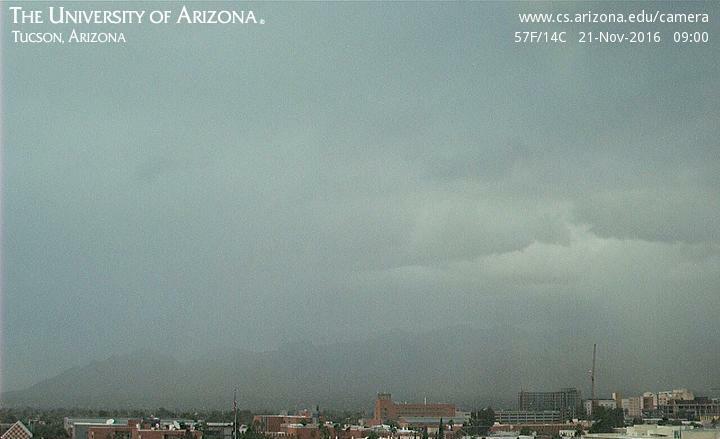 Forecast above is valid at 8:00 am MST, while below is for noon. The model forecasts rapid clearing and sunny skies for the afternoon as the high clouds zip rapidly to the northeast. Also took a look at the model's forecast for skew-Ts at Sonoita, since I'm following the local winds at the Mt. Hopkins RAWS station. Sounding above is valid at 7:00 pm this evening, and the layer of easterlies is deep enough and strong enough to perhaps support gusts of 30 to 40 mph, or bit stronger. Not a clear cut situation, as easterlies reach just barely to top of Santa Rita Sky Island. By 4:00 am tomorrow the model forecasts a much more shallow layer of east winds, so if strong winds develop, they won't be long-lived. The longer-term outlook for next week and start of December remains much cooler and unsettled. 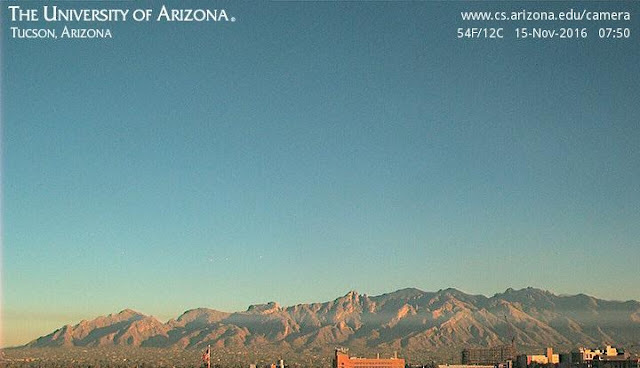 Yesterday the showers and thunderstorms stayed mostly over and west to north of the Catalinas, with only some light showers in parts of the metro. 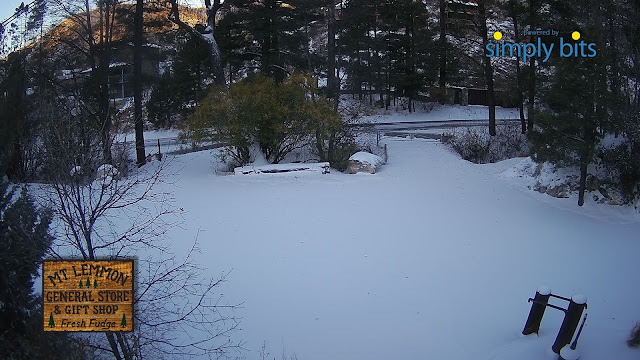 Here at house we ended with 0.05", while low this morning was 37 F. View above is from 9:00 am MST yesterday morning, showing some light rain between campus and the foothills. There were some thunderstorms around as per yesterday's detected CG flashes (from Atmo and Vaisala) above for 24-hours ending at 5:00 pm. Radar/gauge rainfall estimates ending at 7:00 am this morning, below, from WDT via Maricopa County FCD. All-in-all a pretty puny event, especially given the model forecasts several days out that indicated much more significant precipitation. Looks like December will come in with considerably cooler and much more unsettled weather, which would be a welcome change. We have been away last several days and have to gone this morning - so just a quick overview of the "event" so far. The WDT radar/gauge precipitation estimates for 24-hours ending at 7:00 am this morning are shown above. This is mostly a radar estimate since there were few rainfall reports over southeast Arizona. Here at house we had 0.02" during the night and the airport had 0.01", while DM had a Trace. None of the ALERT stations in eastern Pima County reported 0.04" (the minimum amount those gauges report). Heavier showers stayed well west and north of our area. The low this morning at the house dropped to 32 F - making it the first light freeze of the Fall here in north part of City along the Rillito. The GEFS QPF plumes from 06 UTC are shown below. The operational version is now almost the driest forecast from the model. The 06 UTC WRF-GFS forecast from Atmo has responded to the model changes and shifted the precipitation area for Monday back over southeastern Arizona and lowered forecast amounts considerably. Models shifting run-to-run, so we'll have to wait to see what next Monday brings. The GEFS plumes for Monday's precip event from 06 UTC last night are shown above - the operational model has dried some but is still a bit wetter than the ensemble average. It is the operational version of the GFS that drives Atmo's WRF-GFS model. The 00 UTC run of the WRF-GFS (on 5.4 km grid) forecasts the PW plume to shift a bit westward relative to yesterday - above forecast valid at 8:00 am MST next Monday morning the 21st of November. These two panels show forecasts of accumulated precipitation from the model for 5:00 am on the 22nd. Above is on the 5.4 km grid and below is on the 1.8 km grid. The model has shifted the heaviest precipitation westward and northward relative to yesterday's forecasts. Will have to just watch over next few few days to see how the model trends with this system. Precipitation Event Early Next Week? The waning super-moon this morning before setting over the Tucson Mountains. Early next week the southern end of a Pacific trough moves into the Southwest. The 00 UTC WRF-GFS forecast for PW (above on the 5.4 km grid) brings a substantial plume of subtropical moisture into Arizona ahead of the short wave - above forecast valid at 8:00 am Monday, November 21st. The model also forecasts a significant precipitation event over southeast Arizona for next Monday, and the NWS POPs for the airport on Monday are currently an aggressive 70%. However, the 00 UTC GEFS plumes for precipitation indicate considerable spread among the various members forecasts for the event on the 21st. Of note, is that the operational GFS (configured differently than the ensemble versions and shown in blue) is a wet outlier wrt to all the GEFS members. We'll have to see if the operational forecast dries out as the event nears - this transition from wettest to driest has happened several times this Fall. 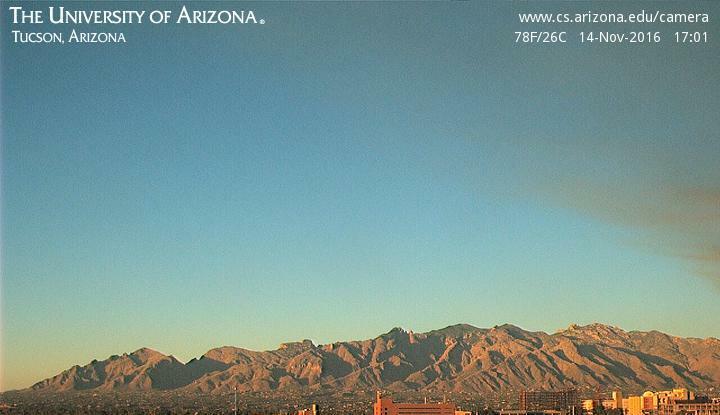 From Mike Leuthold - an image from the Atmo web cam showing the full plume of smoke. A controlled burn on Mt. 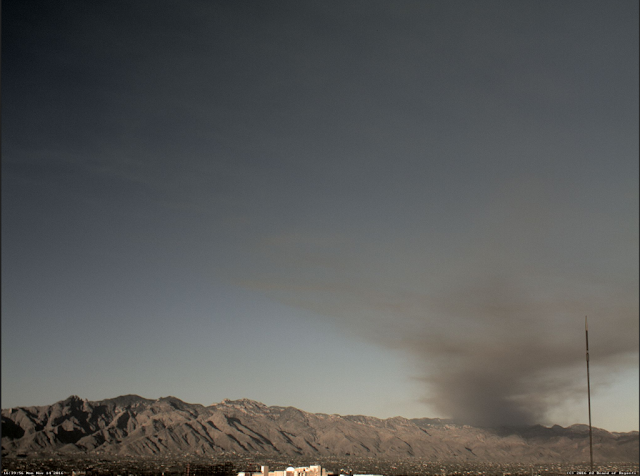 Bigelow sent a dark brown plume of smoke over the eastern parts of the metro area yesterday. Western edge just captured by the campus webcam view above. This morning there is a thing layer of smoke along the foothills (below), with several layers of thicker smoke off toward Redington Pass. Coolest morning of the Fall here with a low of 40 F. The Sasabe and Empire RAWS sites were flirting with freezing with lows of 35 and 36 F.
The 06 UTC plumes from the GEFS indicate a strong, cold frontal passage early next Thursday morning (November 17th) with very chilly highs on both Thursday and Friday (above). However, only a couple of the ensemble members forecast spits of rain with the front, although one member seems a bit bonkers with its half inch forecast. The front is ahead of a very cold, negatively-tilted short wave that is forecast to move across the West (above is 06 UTC WRF-GFS forecast of 500 mb winds and temperature valid at 4:00 am on Thursday). The 10-m wind forecast for the same time (below) indicates strong, lee-slope winds for all the Sky Islands of southeast Arizona.